When people find out I run a personal finance blog, they immediately assume that I’m super frugal and don’t ever spend money. In other words, they immediately start to judge me. And to a certain extent, it is true that I’m frugal. But remember, you can be frugal about all of the garbage that doesn’t matter and still spend money. I do this so that I can spend extravagantly on the things that do matter. And for me, that looks entirely different than for someone else. But I’ve found that as I’ve started writing about personal finance, more and more people have started making comments about my spending habits. Sometimes they don’t think I spend enough, sometimes they’re surprised that I’ve spent so much. Which is kinda crazy, I mean, they don’t know how much I make or where most of my money goes, yet they immediately make judgments when I buy (or don’t buy) something. This used to really bother me, but I’ve finally gotten to where I just let it roll off my back. But while I’ve started to learn not to let it get to me, the more I think about it, I do think this a real problem that needs to be addressed. And it’s not just their problem. I find myself making judgments about others too. It’s natural and easy. For us and for others. It isn’t just a problem for the people feeling judged, it’s a problem for everyone. When someone judges you about something you’ve bought, most of the time it just doesn’t make sense. Now to be clear: I’m not talking about your parents or your close friends being concerned about your well-being. They likely know more about you and more about the context of the entire situation. Maybe they’re concerned that you aren’t saving enough money and are simply trying to help. But most of the time, this isn’t the situation. Typically some of the people who judge you the most are your coworkers, mediocre friends, and extended family members. I mean, most of these people don’t know anything about my financial situation. They also don’t know anything about mine and Hanna’s long-term goals. How in the world can they possibly know what is or isn’t a good decision? Take Mr. Money Mustache for example. This guy and his wife worked for 10 years and saved over 70% of their income to invest for retirement. They lived extremely frugally and cut in every possible area. They were able to save a massive amount of money in a short time and then retired at the age of 31. Now they have they next 50 – 60 years of their lives to do whatever they want. Sure, it’s great now, but can you imagine the type of judgement they got during those 10 years? I can’t begin to imagine how many people told them they were depriving themselves and living a miserable life. Yet these same people likely can’t stand their jobs, yet will be working them until well into their 60s. It’s the same in your life too. Your friends, coworkers, and family members may not know what your long term plans are. They may not know that you want to move in a year, or that you want to go back to school, or that you plan to retire early. They may not know you are planning to sell your house, buy some land, and build a tiny house on it. Yet they still judge freely and openly. Just ask any pregnant woman about judging. She’ll tell you about how people come out of the woodwork to give parenting or pregnancy advice. It’s crazy! I’m talking random people in Walmart coming up to you to give their best advice ever. What makes them think they understand your situation enough to give advice? Yet it doesn’t stop them. And it’s the exact same way with money. People feel the need to make judgements on you because of what you do or don’t buy. Which is weird because we know that people have different needs, different wants, and different log term goals. Which means the way we spend money is naturally going to be different. But that doesn’t answer the question of why people judge. If people are different, and we know this, you would think that judging wouldn’t be such a problem. The first problem is that most people have a misconception of money. They assume that everyone has the same needs, wants, desires, etc.. They assume that everyone wants a new car, a big house, an iPhone, cable TV, and a beach vacation every year. And if you deviate from that at all, well then you’re just cheap. These people don’t understand the idea of being extremely tight on some things so that you can spend a lot on others. For example, Hanna and I don’t really care for nice cell phones. So we pay $25 per month, total, for our cell phones. This saves us close to $1,000 a year compared to the average cell phone bill. We also just bought a dog a few weeks ago for $1,000. Most people would think that’s insane. But it was extremely important to us that we get a very specific breed. To us, it was worth it. And we would rather save money in places we don’t care about, to spend extravagantly on the things we do care about. The second thing you need to realize about people judging is that most of the time it comes out of jealousy or insecurity. As humans, we hate feeling like we’re doing something wrong or stupid. And when people do something different than us, it sometimes makes us feel like we’re inferior. So we start justifying our actions. And then we start making assumptions about other people. This is why overweight people claim that they’re enjoying life more than skinny people. They claim skinny people don’t get to have any fun because they’re counting calories. It’s why people who live paycheck to paycheck say that people who save are cheap and that they’re actually using their money to enjoy their life. And it’s why when I tell people about how little my cell phone bill is, they immediately start telling me all the reasons they need their expensive iPhone. And I’m always like dude, I don’t care how much you pay for your phone. If you’ve thought about it, and it’s worth it to you, then by all means, go for it. That’s great. It doesn’t make a difference to me. But people start to feel insecure about their own actions whenever they’re around someone who does something different. It’s the first step to not letting this judgement bother you. Realize that they’re judgement isn’t really about you, it’s about them. So we’ve talked about how people judge without any good reason. And we’ve talked about the deeper problem behind this and how we can start learning to just ignore it. But now it’s time to talk about our own judging. That’s right. The judging that we do. And I know you do it too. But if you hate it so much when others judge you, why in the world would you judge others? And I’m not getting on to you here. Especially because I write about finance, I often think that I know more than others (even though I don’t). But I can turn the very same thing I said earlier on myself. After all, I don’t know the context of their situation. I don’t know how much money they have or how much money they’ve inherited. How could I possibly know if something is a good or bad decision for them? And yet it doesn’t stop me either. Maybe it’s because I’m insecure. Or maybe it’s because I’m jealous. For me, I think it’s a mixture. Sometimes it’s jealousy. It’s not always that I wish I had more money than I do. It’s actually weirder than that. Sometimes I wish I cared less about personal finance than I do. Like I wish I could not think so long term about money, and just live for the moment a little more. Yea I think it would cost me in the long run, but the human side of me thinks it would be fun to be financially irresponsible sometimes. I’d be lying if I said I didn’t think that. Other times I think I do it out of a superiority. I have a problem thinking I’m better than others because of how I spend money, and looking down on people makes me feel that way. It’s the same reason good-looking middle schoolers make fun of the acne covered kid. I know this makes me sound awful. But I’m just being honest. And I have a hunch that I’m not alone. We’re all human. We all have flaws. Next time you start to judge someone for what they’re spending, try to stop and ask yourself why you’re doing it. Are you jealous? Are you insecure? Or you trying to feel superior? Realize that this isn’t helpful for anyone and not only hurts them, but it hurts you as well. The bottom line here is that everyone is different. 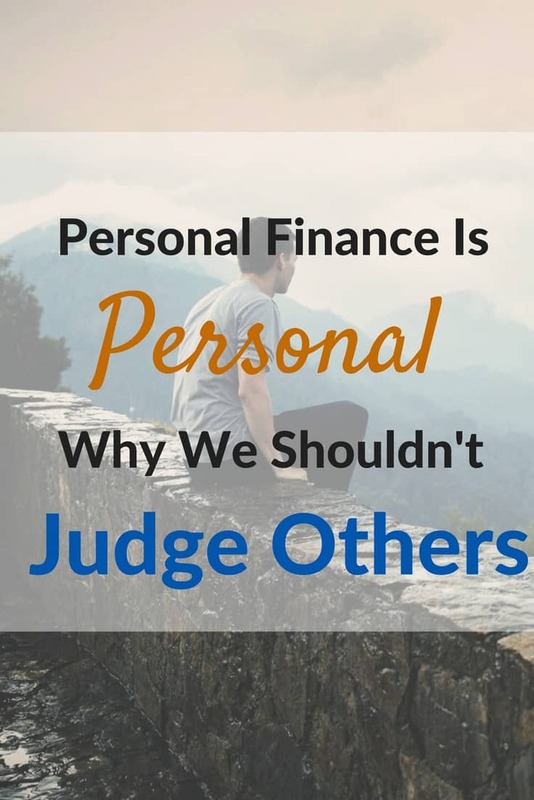 In the same way that everyone finds their own career, place to live, timing to get married, time to have kids, how many kids to have etc… people also find their own way when it comes to finances. We hate it when people judge us, and it’s time for us to stop judging others. I need to spend more time focusing on my own finances, and helping others, instead of watching from a distance and judging them. What about you? What will you start with?